All training is led by our Head Goalkeeper Coach Eugene Alves and our Assistant Goalkeeper Coach Ben Cowman. Coach Eugene is the former Goalkeeper Coach for Darby FC League One Men and DRSA District Program and also played League One, US Pro and NCAA College. 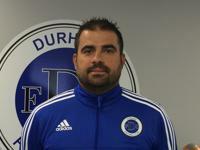 Coach Ben played at University of Western Ontario, St. Bonaventure University and Durham United League One Men. Training will take place on our indoor turf field at FC Durham Academy Training Centre (ATC).